Israeli Air Force Conducted Air Raid On Gaza Strip 4.875 out of 5 based on 8 ratings. 8 user reviews. Israeli Air Force has conducted an air raid on the Gaza Strip (the site of Beit Lahia) a few hours ago. The raid reportedly targeted military facilities belonging to Hamas (Islamic Resistance Movement). Apparently this raid was the one more consequence of the escalation of the situation in the Northern Sinai and the Gaza Strip. The Israeli army spokesman said that the IAF (Israeli Air Force) targeted two sites belonging to Hamas in the north of the Gaza Strip as a response to a missile fire on Ashkelon. Palestinians are the Jews of Israel. Exactly …… there was no diaspora of Jews following the destruction of their Temple by the Romans in the 1st century. No historian, whether ancient or modern, has ever written about any diaspora of Jews from the “holy land”. The Jews didn’t all of a sudden just move up to Poland and Southern Russia. Those Jews are European converts to Judaism. The Biblical Jews under Roman occupation stayed right there in what later became Palestine. Over time, the Jews evolved into the ethnic mix of the present day Palestinians, which is a mixture of Canaanites, Jews, European Crusaders, and Arabs. Palestinians are the only real real Jews (with the seed of Abraham) still left on this planet ! Forget about those fake imposter European Jewish converts. Palestinians are God’s real chosen people, entitled to the land they occupy forever. No Ashkenazi has even a tiny trace of Middle East ancestry – zero! stampede to colonize the land would begin by European Jewry. European jews are sneaky. Very sneaky. Sorry to correct you, but you are wrong. Fi in Safed there was a jewish community as of the early 14th century. Ottoman records show that in 1525 the city of Safed had 1160 (sephardic) jews and 3644 muslims, so a quarter jewish. In 1595 this was 4553 muslims and 8130 jews, so some 2/3 jewish. This shows you are clearly wrong an off the mark by at least 350 years, most likely by some six centuries. Beyond this, there were the samaritans which at the time were in much larger numbers than nowadays because of (forced?) conversion to Islam. Samaritans are Israelites and considered to be jewish. Please, when spouting nonsense, do a little bit of reseach, it is all easy to find. Do you dispute these population figures and that all the 15,000 Jews were European? Please explain why there are no more indigenous Palestinian Jews left in the world today? Can you make a real comment or not ? Seems to me the only one making an idiotic statement is you. The fact they look more European than of Mediterranean heritage and are even German, Polish , Ukrainian heritage. Never put too much into them to be accurate they need both parents and DNA markers can change with the expansion of the data base and they can be an identifier of other groups and genes are inherited, but with an increase in time better DNA testing can be developed. 41.9 on his father’s side was British Irish. of things but not DNA. Still 23andme had used originally only one parent but when comes to specifics this could change when the data base expands , also testing can become more specific since DNA testing is limited. The more information that is inputted into any Data always changes the data collection even grandparents can change the make up. You mean… as opposed to supporting the Saudis who bomb Yemeni schools, hospitals, funerals, weddings and children – even tho’ the whole country is dying of starvation and cholera? No I mean Houthi Yemenite Killers who are killing their own brothers and sisters. And she supports those killers. Saudi’s are bloody killers too and should go to hell. And I ask because BOTH sides are killing civilians – it’s war. PS. Internal struggles would not progress to “killing brothers and sisters” if EXTERNAL players did not arm their preferred side. then started bombing the country. Shi’ite Houthi rebels in Yemen, also known as Ansar Allah, have seized several territories in Yemen during fierce fighting over the past few years, including in the capital Sana’a. According to UN figures the fighting has led to the deaths of up to 4,500 people, including more than 2,100 civilians. The campaign group claims Houthis fired mortar shells and artillery rockets indiscriminately into populated neighbourhoods in the southern Yemeni city of Taizz in August 2015, “without regard for the safety of its residents”, killing at least 14 civilians, including 5 women and 5 children. While laws of war do not prohibit sieges of enemy forces, starvation of civilians as a method of warfare is prohibited, as is confiscating or destroying objects that are indispensable to the survival of the population. What you say is so true of the illegal bombing and attack on civilians by Saudi and other players ,like the US and it’s current proxies in the region called Al Qaeda. The issue had to do with the Saudis attacking the civilians and then blamed the Saleh Govt to put their dictator in power and back him with Foreign mercenaries Arab scum. Since we do know this was a country targeted by the US which used the Sauds to attack for a resource grab, which Israel and US companies want access to the resources for dirt cheap. Trusting HRW to not be infested by Intelligence operatives is why there is always questionable sources being provided. The Saudi are bloody killers and should be handled as killers. I am talking about the Houthi killers, you jump to ignore. The resource are Human rights from the UN and not some Saudi news. So if it makes you feel good that Only the Saudi are the killers and the Houthi’s are Angles,Well get back to your Thousand nights dream. The Houthi are killers that slaughter their own brothers and sisters. There are evidence of tens of incidents that those Houthi’s slaughtered innocnet YEMENITE civilians…..
keep on smoking you pipe. The UN is infested with too many intelligent officers from various countries can never trust any of their Organizations like the OPCW which is a large part reports to NATO intelligent groups.Most of your NGOs are infested with them and some with no success in purging them UNSCE is full of operatives just a sad state of affairs when they interfere in the political process. Most evidence they get is provided by the one side , there have been hundreds of cases of Govt Troops, Sudanese, Saudis involved in these attacks on civilians, just keep living in the gold fish bowl things always look different. The problem in war like this there are no real innocents , but most of the massacres are attributed to Suadi side and those are horrendous they use Sudanese who indiscriminately kill , Sauds are no different they kill many just to get to a small group, the US allegedly attacked civilians and then came under fire by the local civilians on an intel mission that was of no importance. There are no innocents on either side even the US is guilty of war crimes. While the UN is the only organization so far who are trying to help those civilians. So while you criticize the UN who are helping those civilians, your Houthi’s and Saudis continue with the slaughter civilians. The UN has failed the Yemeni people by failing to act against the horrendous human rights violations by the side they can but are unwilling to control the creation of a no fly zone which violates humanitarian aid and necessary medical aid for those within the country has attributed to 38,000 deaths so far. The UN fails on so many levels that it is fast becoming irrelevant , they allow illegal violations of international law to go unpunished. Time for you to get off your high horse and realize the problem is the US and not blaming the Houthis and the legitimate govt of Saleh for this problem since they have no control over the UN and it’s blatant disregard for human life since the beginning. The UN only acts now after this has become a humanitarian issue while allowing it to escalate into this situation. You can’t shut down airports and ports that allow food or block humanitarian aid to get into the region is what the Saudis/GCC along with the US have done since the beginning. The blame falls on the UN for this situation as this has been the cry while US UN ambassadors opposed any aid going to the region.Keep on with your misrepresenting facts and you will soon see the truth which you won’t like. Not to blame the killers but to blame someone else…………. UN is not the police in this murderers zone. The Houthi’s and Saudi’s do the slaughter, they are the murderers, they are to be blamed, that’s the only truth ! At list the UN dose something, what do the their Brother Arab countries, Zero and blame others. So get out of your traditional shell and look at the murderer’s first. The complete lack of knowledge by you in this regard is quite obvious to see since the UN blamed tens of thousands of civilian deaths on the Saudis and their led Coalition those were from direct bombing and indirectly the death of 380,000 due to their illegal and inhumane restriction on ports and airports. Just the difference is i lay the largest blame where it belongs and someone like you tries to deflect and project that blame on the Yemeni people resisting the imposition of Hadi the disgraced puppet of the Sauds and the US govt. Look to how you portrayed the worst violator of these rights of the Yemeni people , the US is even largely responsible since they requested the Saudis to interfere in the region which started this whole entire mess and the US continues to bomb it with predatorial airstrikes,the US is even responsible for Al Qaeda being there. My assumption you are an member of the terrorist state called the USA, trying to hide behind so called democratic crocodile tears. Nations like that are the problem why issues like these exist and you can’t force a right wing democracy on Socialist democracies because you feels they need it. I see that your fanatic blocked mind is not recoverable. When a Person kills, he is blamed not his surrounding or parents or who ever it should be. Your Houthi’s you defend so much are savages killers same as the Saudis, that slaughter thousands of innocent civilians. Your culture has been known long ago as “killing one another” and put the blame on someone. Your Houthi killers and the Saudi killers are in the same boat and are BOTH savages killers. Stop with your sick and twisted facts you are in need of some serious mental help go find it and kindly stop spewing Mass Hysteria Media propaganda. This conflict has been going on since the 2000’s with US aiding Saleh government at the time now the deposed Hadi govt , the problem is the writ of the government never extended past the borders of Sanaa City and all these factions have existed since the 80’s. Why there is so much jockeying is that the US deposed via the UAE and Suadis the Saleh Govt which had more support but Al Qaeda has been there since the 2000’s as a terrorist group destabilizing the country which is supported by the CIA. They then installed Hadi and his GOVT with very little support in the country back in 2011. Your country is to blame since they ordered these sick Wahhabi Saudis and UAE to invade while the US uses predator bombing and now even troops to install their puppet who was ousted by the various factions and military since he refused to leave. The houthis are a small faction among the Zaydi ,which the Zaydis always had regional control in the North since prior to the Saleh govt.. The real killers are people like you who are part of the problem and not the solution. Always trying to weigh into the situation without knowing any of the background. Just keep your mindless dribble and baseless accusations to yourself. Keep supporting the false narrative on things since ,you seem to understand little of the conflict. well you just exposed yourself. keep on killing and blaming others, that’s your life. I am not the one who exposed themselves as US terrorist murdering scum supporter, so quit your deflecting, like I said you are the problem go hide in your terrorist country supporting safe space. Your country sponsors these terrorist groups and you have the nerve to assume I am a Takfiri and a terrorist you have some mixed up and warped ideas. You support those Houthi Killers. So who is the Terrorist here. BTW I am not American, so your argument is dead. Keep on supporting Killers and Blame others……. typical Jihadist propaganda. Are we going to blame everyone for what their ancestors did – or Just Jews? Btw, one can find many blond people among northern arabs, kurds. 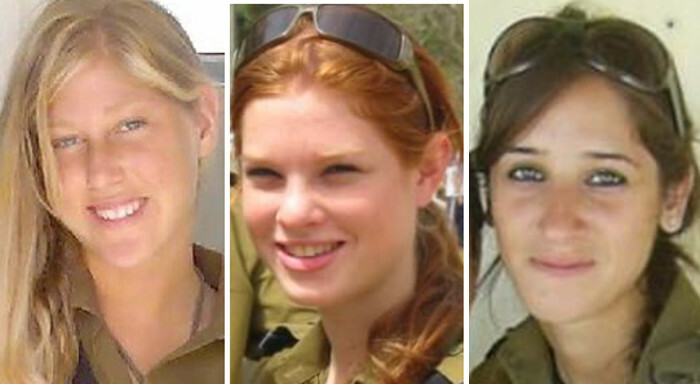 One can find many darker people among Israelis. All sectarian nonsense. “The Israelis” are Chinese, Kenyan, Ugandan Ethiopian, Nigerian, Yemenis, Iraqis … are they not? a) Do the “darker Israelis” from Yemen, Iraq, Nigeria, Ethiopia? b) How many blond Arabs are there out of 380,000,000? Would their DNA but 99.9% European like the DNA of the Ashkenazi? You’re a pretty racist lil itchy bee aint yah! What people are BORN WITH they can do nothing about! And accidents of birth should not denote privilege or penalty! a) The French colonized Algeria and the British colonized Kenya, but it was understood to be a colonial project. The Ashkenazi – equal European – engaged in a deception and said he was “coming back”, did he not? Color and race would not even be discussed in the case of the French and the British because they do not deny to be European. The Ashkenazi does deny to be European, despite DNA evidence. The word “racist” covers a multitude of sins. DNA is something you’re born with. If you want to discuss ethnology I suggest you find an ethnology forum – they’ll have the experts. Well – get going then. …Love must be mutual or it’s not love. Great – then I won’t be getting any more of this shìte from you. 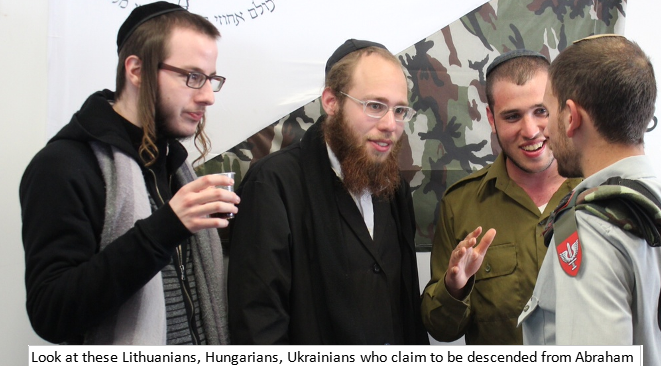 They still look like colonials and converts, though and as stated Judaism is not a race but a religion. Neither is albinoism – shall we condemn them too because they don’t look right? Racism is used to cover anti-Islam – it can be used for anti-Jew too. In fact, racism covers a awful lot of ground these days. It might not be purist but it is actual. The argument that it’s racism is still invalid since religion has always been open to disagreements and disputing fictions can be the norm today since we can test through archaeology and other historical data , which has been proven where religious text has been unproven in some instances and prone to be revised to meet context by it’s proponents. I hear you – what word shall we use to decry religious intolerance? The thing religion has always been disagreed with constantly , there will always be opposing opinions. The question was: are these European colonial settlers like the French in Algeria and the British in Kenya? Nobody cares if they are Jews or Hindus? So you can tell me I am not African and I don’t belong in Africa – because some of my ancestors came from some white dude country long long ago? Most people think that jews are from Palestine. But, it’s absotulety false. Jews are Hebrews and Hebrews came from south Iraq. The went to Palestine to steal Canaanites land. After that, some Europeans converted to judaism, some north african converted to judaism and came to Palestine to steal the land of Palestinians. A few people unfortunately know that. As you wrote above: Israel is defended with arguments basing on a book full of tales and myths and without a people. All peoples came from somewhere else. According to the bible early hebrews were nomadic like so many peoples of the time (Arabs are still partly nomads). They migrated trhough many lands and settled in what is now Israel and West Bank and part of Jordan, among peoples that were exactly like them. As we know the languages of that time, Canaaites, Phoenicians, Moabites, and Hebrews spoke more or less the same language, mutually intelligible as far as we know. But why are you so upset by jews. Arabs did all of this on a much grander scale and you do not see any problem in this. Persians did too and turks did too though much later. The Ashkenazi who is 100% European claimed Palestine was his ancestral land, did he not? Is it? The Ashkenazi used a trick of “coming back” so he would not have to go back like the British in Kenya and the French in Algeria. It’s false. Heberwes came from south Iraq. Canaanites are the real Palestinians. You are so upset by the truth. Not my fault if you are a terrorist. Look at the religion of “peace”. “Only the women and the children and the animals and all that is in the city, all its spoil, you shall take as booty for yourself; and you shall use the spoil of your enemies which the LORD your God has given you. Promised Land. That was a long, long, long, time ago. Nope. The first genocide in human history. And they are doing exactly the same as they did a long, long, long, time ago. God doesn’t exist. If I say that USA belongs to me and I write it on a book, does it mean that USA belongs to me ???? Not necessarily the first genocide. Remember the babies being thrown into the Nile bit? I am not arguing whether God exists. I am a Christian and do believe the Bible to be accurate. My point is that when the Hebrews left Egypt into Canaan’s Land, that is a specific event. The command is specific to the conquering of the land and not an open ended. I am not excusing the Israelis excesses, abuses and atrocities. Even the command you cite was modified later because Joshua’s promise to the Gibeonites. All I am saying is that those verses are only applicable at the conflict at the time. It’s wrong because israelis are doing the same thing since 70 years by now. It wrong because, among other things, is not sanctioned by their Scriptures. The Israelis use the Bible when is convenient, many of them are atheists, and then are more than willing to misuse. Unfortunately, I see a lot of pulling verses out of their context by Christians too. Of course. Most of them are atheists. But they have no country because israel is a fake country created in a book. Now, they have been trapped in their own madness. So, they try to build a secular country build on myths. A country with no people. I am afraid we are beginning to talk past each other. Like it or not, Israel is a country, regardless of how I got started in recent history and just like other countries, it got started with blood. Unfortunately, it continues to flow, for many reasons and many of those reasons are of Israel’s government machinations. You are totally wrong. How many countries do you know that don’t have a people and that have been created in a book ????? Only one : israel. LIke I wrote, we are beginning to talk past each other. The rationale varies. Want to compare the reasons, fine. But in the end, countries begin through blood letting. Would it be any better if the wars and deaths were due to the Little Red Book or Mein Kampf or the Communist Manifesto? All atheists documents. I have never heard about a country called communistan. You are wrong. You have to face the truth. You have been fooled by myths and stories. A communist can be russian or chinese or italian. If he stop being communist, he is still russian or whatever. If a jew stop being a jew, he is nothing. There are no countries named after a tribe or group of people? Decide what you want to argue. My original point is that Israel is violating the very document you keep putting down. There are communist countries that were brought about because atheist adherents were faithful to their founding documents. Your fellow co-religionists have plenty of innocent blood in their hands. Now, you put that in your pipe and smoke it and dispense with your holiest than thou attitude. There is no country based on a book execpt israel. You are misleaded. You are talking about a tribe. But, we have never see in the world a tribe without a people !!! These jews are not hebrews, they are Europeans, north africans, ethiopians, …. You know, the violence of communism is just the reaction to the violence of these religions. Communism have made very less disasters compared to religions. And communism is short in time and is now over. These religions keep killing people since they have been created and they will do in the future. We went past each other. People reading this exchange will judge for themselves as to the validity of the arguments and will reach their conclusions. israel is just like ISIS. Mein Kampf is a very interesting book. And both Israel and the USA have to been destroyed or stopped for ever. A duty for next generations. The violence of judaism, christianism and islam come from judaism. They have the same rotten root. The more they expand, the more the world is in danger of destruction. Right. The same rotten root!!! israelis are doing to the Palestinians exactly what hebrews did to people in that region more than 2000 years ago. The Muslims did nothing to the Jews, Catholics, Zoroastrians, animists, etc? The US, NATO and Israel always only ever bomb those who can’t bomb back! Because they are cünts and cowards – the lot of them. Look at these Israelite – the grandchildren of Abraham. Look, these are not white people. Nope! They are Israelite!